History: (Captain America Comics #13-27, USA Comics #7-9, g.a.) Roddy Colt and his younger brother Tom were delivering copies of the Freedom Star newspaper when a speeding car knocked Tom off his bike, breaking his leg. The occupants, a pair of gangsters, then stole defense stamps Tom was transporting. 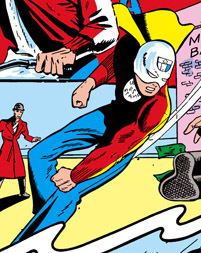 After Roddy's friend, reporter Jerry Dash, took Tom to the hospital, Roddy decided to fight crime as the Secret Stamp. Comments: Created by Don Rico and George Klein. Thanks to Gus Shaw for updates and corrections.